More than a decade ago, Hieromonk Seraphim Rose warned, ". 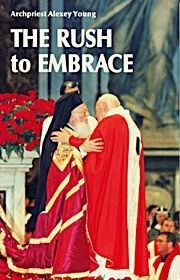 . . many of the Orthodox hierarchs are going much too far in following Rome, which is following the Western confessions. It will come to a disaster before long." Since then, a majority of the Orthodox Churches have continued moving in the direction of union with Rome. Here, Fr. Alexey Young, a former Roman Catholic, has expanded and updated his popular booklet, "Winds of Change in Roman Catholicism", to explain why today’s "union fever" places Orthodoxy at such great risk. He appeals to Roman Catholics to examine the "reforms" which over the centuries have cut their Church from its ancient roots, and strongly urges his fellow Orthodox Christians to consider the consequences of uniting with a Church so radically different in dogma and in Spirit. Softbound. 95 pp.